Red Sox – "Mail Guy"
I was first attracted to the script because it was dialogue driven and it had a certain dark comedy that I enjoy. The story took place in a corporate environment which I am all too familiar with and that helps when you are selling this type of comedy. I also thought it would be fairly easy to produce and when you are choosing spec stuff, that is a consideration you really can't ignore. I am exploring dialogue/storytelling so this was a natural progression for me. I think my vision is growing constantly, but a spot like this can really help distinguish your style. As soon as I read the script I knew who my two principles were going to be. Nik (the mail guy) I had worked with on a pro shoot last year. I loved his delivery and charm and I knew he would nail it. 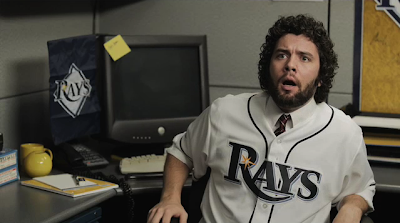 Mark (Rays fan) had read for me on another job but sadly didn't get the part then. I remembered him and reached out. Once you have your principles, the rest kind of falls into place. But Dan (the laughing guy) was a last minute fill in recommended by another actor. I got lucky there too. Dan was just what I wanted. We had lunch a week before and went over the ideas for the performances. I make it a point to do this whenever I can, because it is imperative for me to know how the actor is going to approach it. You get a lot of great ideas there. I wouldn't call it rehearsal. It is more collaboration. Location was an office that I have access to from time to time, so it was a done deal. At first I was not into it aesthetically, because it is kind of drab. But it photographed really well for this spot and drab corporate environments are what a lot of people identify with. And you have to embrace what works for your story. It is about these characters sharing the same piece of carpet day to day. It has to feel real. I have worked with this crew on many shoots (pro and spec). I work quickly and they match that in efficiency. But it really comes down to talent. They know how to shoot. You learn a lot listening to those who have shot a ton of stuff. It informs how you board, how you block, and how you tell your story. Also, my art director is great. We have worked together before and she really came through on this spot. The shoot went pretty smoothly. We did it in a day. We made a conscious decision to shoot on one floor of the office and in relative close proximity to each setup. Therefore, we weren't burning a ton of time on moving the lights. But the set dressing and the initial lighting setup took a couple of hours. That is when you are looking at your watch and thinking "am I going to get all the coverage I want???" But I have a tendency to sweat that stuff and I always end up with enough time. I think there's always something you would liked to have shot or thought you could do differently, but then you get to the edit and it is pretty much just what you need. I have worked with my editor on a lot of stuff, so I trust his choices. We discuss what I want and he does a rough cut. This allows me to get a slightly different perspective on it. My best advice to all new directors is to try not to fall in love with what you have shot. Just because it looks cool or was funny on the day doesn't mean it will fit into the edit or help with the story. Now on this spot I didn't have that issue as much, but I have moved on from being too precious about every frame. Anyway, we did several cuts as you would normally do. You find the beats, the right takes. Then I sent it on to Dave. He gave suggestions and we finalized it. The whole process of producing the spot started and stopped a couple of times. It was just trying to get all the pieces to fit together. So, I wish it had been a little more fluid. I would always rather have a producer handling the logistics, but in the case of the last couple of specs I have done, I have been wearing that hat too. That is kind of stressful. Overall I am very satisfied with the end product. I don't think I would have changed anything knowing how well it came out in the end.